For the current holder of the title Duke of Porto, see Infante Dinis, Duke of Porto. 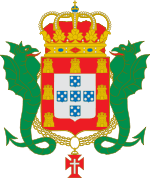 Duke of Porto (Portuguese Duque do Porto) is a royaly-held noble title of Portuguese nobility. The title's namesake is from the city of Porto, in the north of Portugal. 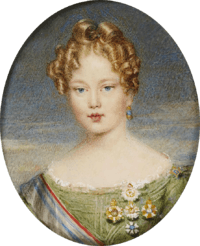 The title was created in 1833 for Maria, Princess Royal of Portugal by King Pedro IV of Portugal. The title's name was made in honour of the city of Porto, due its loyalty to Pedro IV and Maria II in the Liberal Wars. Following the use of the title by Maria, Princess Royal of Portugal, the title became associated with the second male child of the head of the Royal House of Portugal. This article is issued from Wikipedia - version of the 2/12/2015. The text is available under the Creative Commons Attribution/Share Alike but additional terms may apply for the media files.